The average speed is quite whimsical. It is easy to lower, but it is difficult to increase. If the way goes through the hill, it always “bites” from the average speed, in addition to being exhausting. I put my parameters to the calculator. I will consider the route, which consists of 4 sections of a half kilometre each: the flat, the rise of 5%, 5% slope, a flat again. Cyclist with my parameters (about 95 kG loaded weight with a bicycle, 200 watts of power, tires Conti Gatorskin with coeff. rolling resistance 0.008, СхА 0.5 m^2) goes these intervals with calculated speed of 27.9, 12.5, 47.0, 27.9 km/h. Average speed on the total route of 2 km is 23.1 km/h, which is 17% less than speed on the flat (27.9 km/h). Increase the path because of relief is not explained this, because the way on 2 km increases to only 1 meter. But 17% drop of speed for the frankly speaking small rise of 5% is a lot. Maybe the point is that it is necessary to consider the inertia? That is, the formula for the steady movement when applied power realised to constant speed may be not applicable on the rise and down. Especially it should be evident in the transition from the downhill to the flat section. 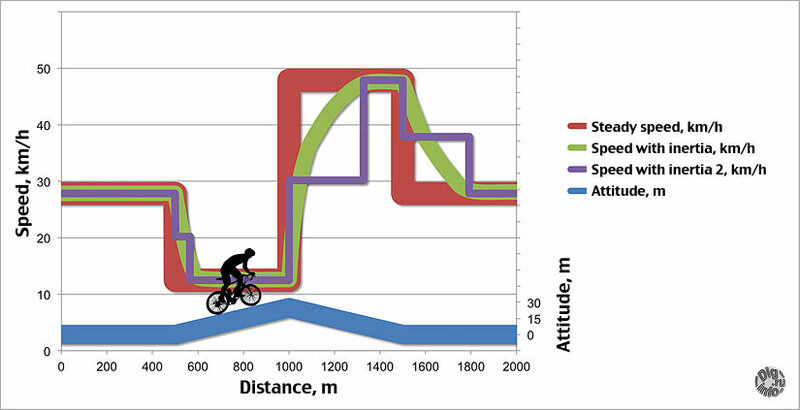 According to the formula, speed instantaneously drops from 48 km/h to 28 km/h, so it clearly shows that such speed at the beginning of flat section is much lower than it actually is. Inertia can be accounted in two ways. You can simply refer to a remarkable online resource: AnalyticCycling.com and build by the points the change of velocity. The second method is more intuitive for me, because it introduces a parameter that not taken into account when considering the steady motion, namely, the kinetic energy. For me, this option is especially attractive, because I’m heavy, while the kinetic energy is equal (weight) * (square of the speed). 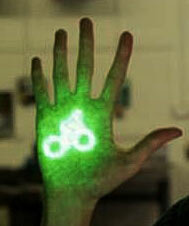 If we go with a lighter cyclist on flat place with the same speed, this “asset” I have more. In the transition from the segment where the steady speed is more to the segment on which established speed will be less positive difference in kinetic energy goes to overcome the resistance forces, which are known (200 watts in this case). Therefore it is possible to determine the time to spend the difference in the energies and take in this area average speed “in half.” Here’s how it looks on the charts. The corresponding average speed throughout the 2-kilometer route will be 23.9 km/h or 23.3 k /h (two ways of calculations), which is approximately equal to the speed without taking into account inertia (remember, 23.1 km/h). That is, accurate accounting of inertia give nothing. This is due to the fact that the inertia works not only “to plus” in the transition from a hill to flat, but also “to minus”. The graph clearly shows that in over hill inertia for a long time does not let speed up. Therefore further we will not take inertia into account. Thus it can be postulated that this is such construction of world: if you take a hill with pedaling at a constant power, it will lead to a significant reduction in average speed. What can we do? 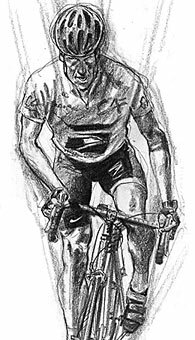 In the network it is possible to find advice that on competition instead of strive to maintain a constant power on the pedals you need to try keep constant speed, that is, down the hill to spend less power, and up the hill greater power. In fact, when go downhill I not push 200 watts, but simply pedalling to maintain control, if enough gears. Let’s say it takes 50 watts instead of 200. Then, to keep the average power in the 2 km route of 200 watts I need to push in the rise of 256 watts (and keep it for 2 minutes). This will allow to redistribute speed in the rise and down and the total velocity increase to 25.0 km/h, which is “only” 10% less than on flat. But even better, from the point of view of mathematics, on the descent better do not pedalling at all, and all “the released” power throw on the rise (282 watts). Then, while maintaining the average power of 200 watts it will give the overall rate of 25.6 km/h (8% lower than in the flat). It turns out that “mathematics” in solidarity with coaches: in order to make the best use of the available average power it is necessary to hard work up the hill with a power higher than the average, and recover down the hills. 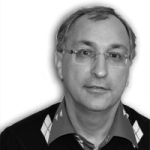 Unfortunately for the average person (sporty but not sportsman), there is nothing good there, because, for example, my speed on a flat, defined by the maximum power that I can give out long. This power, especially after traveled 100 km determined by the internal energy balance, my body can produce just this amount of energy per unit of time. Climb in the higher power is dangerous. This may lead to irreparable loss. Especially when it is not known how much it take. It is only the calculation of such routes can show that it is possible to take for two minutes 282 watts. And in fact, not only real hill is unknown, but also is not clear how to determine the 282 watts based on feel. Based on “feelings”, it is easy to control only stable “cruising” power with little flexibility, a little more or a little less. So as I usually do, go with my steady power in flat while up the hill starts to give greater power and based on the experience try not to get into the “irreparable” loss of energy. That is, if reserves ended before uphill continues, slow down to spend of usual power. I touch mentioned above effect of kinetic energy. It is inertia. It helps to overcome the unevenness of movement. With good speed bicycle itself overcomes bumps, swallow nonideal relief in the form of small pits or “micro hills”. 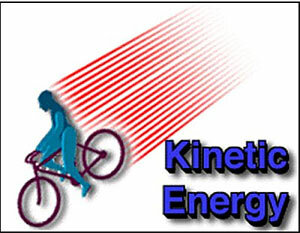 In the above example, the kinetic energy of the motion on a flat is 5 times greater than when riding uphill! It means that during uphill any unevenness on the rise pulls back down. Including uneven effort when pedaling. 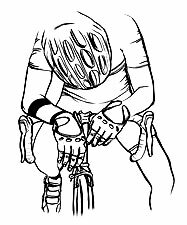 Therefore, even though in the network often advice about high cadence to uphill (as athletes) to ordinary cyclist it should be applied with caution. Athlete when driving uphill capable long time (hour, for example) to produce output power 500 watts. Therefore, their speed and thus their inertia fundamentally different. More exactly their movement is much more smooth because their speed is much greater. So “normal” cyclist may be needs to lower cadence (more exactly let it slow naturally), because with slow pedaling you can react to the inevitable bumps of movement much easier if lack of inertia.